A couple of years ago, I posted about our Morning Basket and how much we enjoyed our together work which we keep in this family basket. I thought I’d share again about our Morning Basket. It seems to grow and change with our family and our family needs as they differ from year to year, so I hoped to show how the Morning Basket might change for your growing family over the years, as well as the ways it has stayed the same.Initially, I conceived the idea of having one point in the day (morning) that we could get some shared work done. With growing children, I longed for a common point from which the day could spring, a point which was beyond grade levels and resisted defining in those standard this-book-is-only-for-this-grade way. In a family with multiple ages and grades, a home educating mom will often look for ways to steward time in efficient ways so that the day runs smoothly. The Morning Basket became my answer to efficiency while also addressing a need I had to combine some subjects across ages. It has long functioned as our common beginning, and is a delight for us. In a Charlotte Mason education, a variety of subjects are provided. This ensures a varied and rich feast of ideas as part of their education. Part of the challenge of arranging a Charlotte Mason day (and beyond that a term or year) is in providing the feast of ideas in ways that are manageable and inviting without being overwhelming. Add multiple children and a span of ages and this challenge of providing a rich variety begins to strongly suggest that you combine a few subjects, allowing the different ages to plumb the subject to different depths. The Morning Basket is an answer for our family in providing a nourishing variety of living ideas and experiences, with each child taking and enjoying the feast to the extent they are able. It is rich for all. 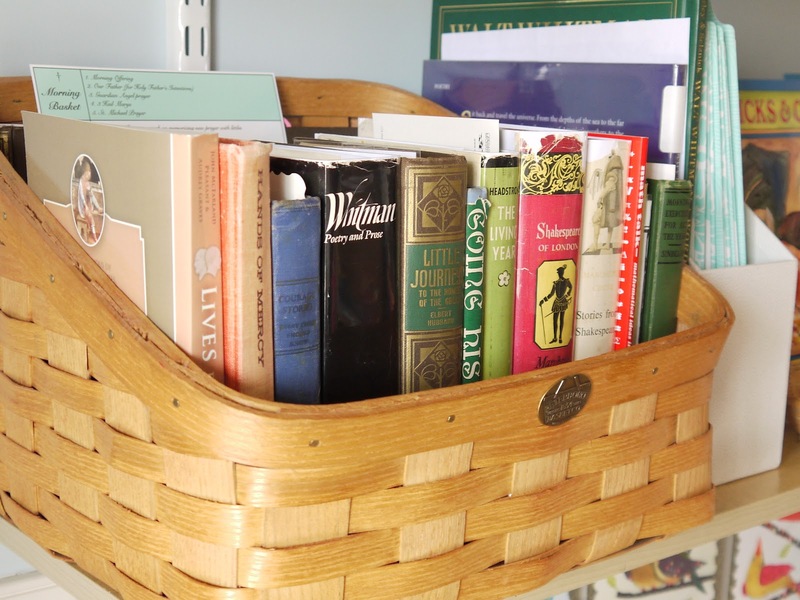 Our Morning Basket could really stand alone, rich and full of history, art, music, liturgical and faith reading, virtue and character education, culture, and natural history. 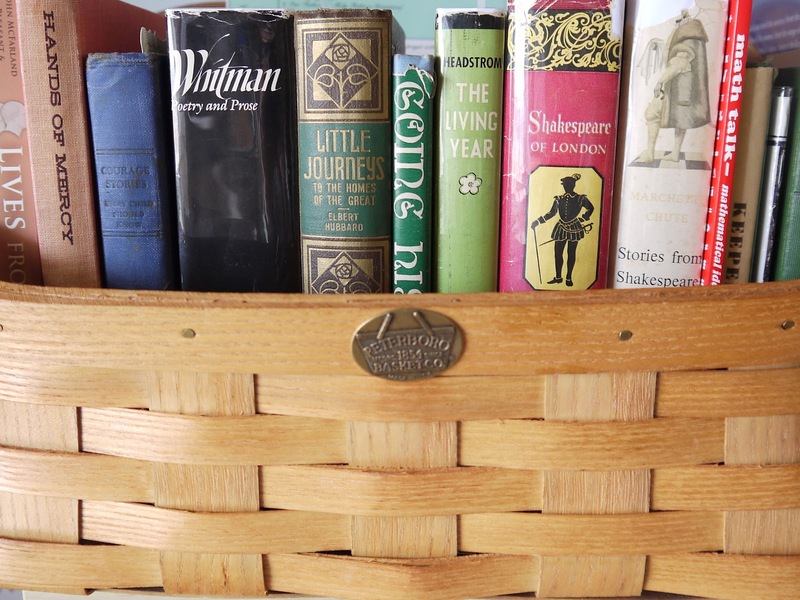 Perhaps the Morning Basket could be considered the rich appetizer, whetting the appetite for the feast of living books and ideas to come in the day! Sometimes (not always, you wouldn’t want to make a habit out of this), if an appetizer is rich enough, you can make a meal out of it and it can sustain you for a time, can’t it? Which means, if the day is full of outside the home activities, or contains an unavoidable interruption, the Morning Basket can stand alone for our day if needed. Isn’t that a consoling thought? One hour of richness that lives in the morning hours. It’s simple, collected and varied enough to provide quite a rich feast of ideas throughout the week….just from the Morning Basket of work. Morning Basket plans – blank grid – print this and pencil in your own Morning Basket plans. In the morning, I simply remove my little chart and assemble the books from the basket that we’ll be reading from for the morning. Shall we talk about some of the resources in this term’s Morning Basket? I’m really excited to share some of them with you because they are such treasures! Morning Exercises for All the Year by Joseph Sindelar – (You can find a free copy for your ebook here.) This is one of my favorite treasure-finds for this year! The book is arranged one day at a time for the entire school year. Each day contains a little poem or thought/quote that exemplifies a virtue or noble habit being fostered for the day. Following that are any significant historical anniversaries. Some days, there are excerpts or stories that illustrate the historical figure whose anniversary (of his/her birthday) is that day, and that also exemplifies the virtue being introduced for the day. The daily selections are short and sweet, but I am hooked! They’re perfect for starting the day in the Morning Basket! Going His Way by Father Gerald Brennan – this is one of the original Angel Food books which remains out of print (originally Volume III). I found it in a thrift store a year ago and quickly grabbed it! Conferences to Children on Practical Virtue by Father Abbe Vetre – I am sure I must have mentioned this little gem here before. Have I? This is an old title, written directly to the child but not at all in a dumbed down, silly way. Recently reprinted, I have been reading through it very slowly with my children for a bit now. It is full of practical and spiritual direction for children to assist them in growing in virtue. Courage Stories Every Child Should Know collected by Helen Ferris, illustrated by Marguerite de Angeli – I discovered this book quite by accident. We were enjoying Marguerite de Angeli books at the time and I was looking around and found this book that she illustrated. When I saw that Helen Ferris (Treasured Poems Old and New) edited it, I was hooked! It’s full of fantastic stories that my children really enjoy! And of course they each convey courage in its most noble forms! The Living Year: A Naturalist Explores the World Outside Your Door by Richard Headstrom – This is a wonderful book to read aloud throughout the seasons. 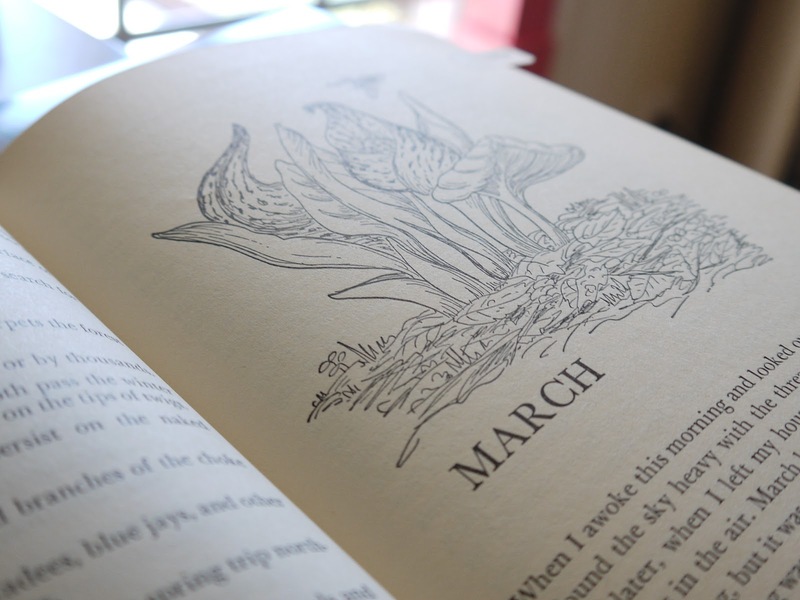 The book has 12 chapters, one for each month. Mr. Hedstrom writes in an engaging way as he explains about various insects, birds, animals, plants and flowers and their habitats. I particularly enjoy the wonder he invites. Nature Friend Magazine – an old friend of ours arriving in our mailbox faithfully every month for the last 9 years, this is our favorite natural history magazine for all ages. Nature Walk time – do you always find this time elusive? Does the idea of a regular nature walk sound great, but it never seems to show up with regularity in your days and weeks? Pin it somewhere! It works great in our Morning Basket time, and giving a full measure of time to it means the children aren’t rushed – they are inquisitive and relaxed as they enjoy the time out of doors, bringing in treasures to sketch and investigate. 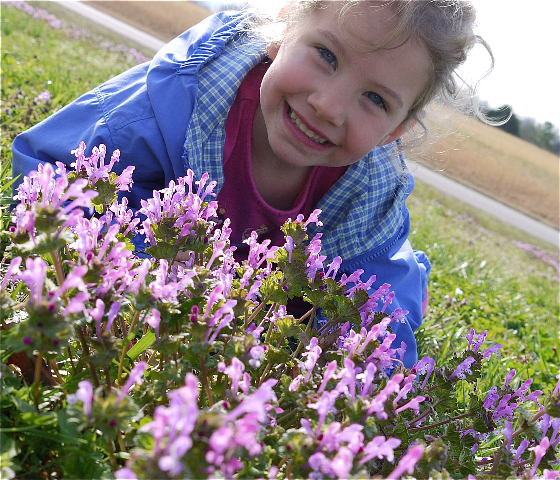 Your best location for a nature walk are the gardens and outdoor spaces right around your home. Make this simple! You don’t have to get in a car and go anywhere – just put on jackets and go outside! As noted on our Morning Basket plans: read from a living book introducing the life of a composer. There are many good choices for this, some I’ll recommend below. The child adds the composer to his book of centuries. Throughout the term we listen to recommended pieces and works from the composer during our quiet work times. We often choose works that are recommended or mentioned in our living book reading. Discovering Music: 300 Years of Interaction in Western Music, Arts, History and Culture by Professor Carol Reynolds – I was looking for a music history course for my high schooler when a friend (thank you, Maria!) recommended this amazing course, and we’re eager to start it. (You can read an enormous number of details as well as viewing and downloading samples from website.) When I played the sample video for myself, all my children came from different parts of the house, completely engaged and excited, asking for more. I was sold when I saw it, too, especially after scrutinizing the content. Fantastic! We’re going to begin viewing and enjoying the course as a family immediately, carrying it over into next year for two terms and then picking up Professor Carol’s Exploring America’s Musical Heritage lecture/DVD series from there. I’m particularly excited about this series, and how it weaves culture, history, art, poetry, even some sciences into the lectures. Far from being static, the lectures are dynamic and engaging – a superior living lecture series! Minute Sketches of Great Composers by Eva Hansl and Helen Kauffman is a favorite resource of mine (not pictured), and is an excellent book for giving a brief and very child-friendly overview of the most popular composers. The Gift of Music: Great Composers and their Influence by Jane Stuart Smith and Betty Carlson is another excellent resource I highly recommend. The historical and biographical information is sound and quite detailed. I really enjoy reading this as part of the introduction to the composer. Of particular help to us are the end of chapter recommendations, especially the recommended listening list which is our standard when we build our composer repertoire for the term. We try to read from the life of an artist, again from living books, becoming familiar with their life. We add an artist to the Book of Centuries (along with the poet and composer – did I mention that?). Each week, I choose one of that artist’s work and print it out for picture study. You can usually find a good selection of art prints to print on your home computer at the web gallery of art. Give the art print/picture to the children to study. Try to do this at a quiet time, or at least a time with as few distractions as possible. Encourage the children to bring their full attention to a painting, paying attention to colors, shapes. Often an artist will hide something unexpected in a corner or in the background – look for all the details in the painting. Allow the children to study the picture for a few minutes. No talking or sharing together during this time. After about 5 minutes, take the picture from the children and ask them to narrate, or tell, what they remember from the painting. No interrupting. Children take turns adding observations. Look at the picture again to see if any other details are noticed. We do this together. Be sure to correctly identify the name of the painting as part of the discussion. Using a resource like Signs and Symbols in Christian Art by George Ferguson, look up any objects that you found in the picture, especially if you’re studying sacred art. Often plants and flowers have a particular meaning, as do the placement of gardens, etc. Encourage imitation of the style of the artist during the week. Allow the children opportunities to express themselves creatively. Study one painting a week. Display the painting in a prominent place after picture study. Jean Francois Millet: A Collection of 15 Pictures and a Portrait of the Painter with Introduction and Interpretation by Estelle Hurll (free ebook available here) – this book offers some excellent context and understanding for some of Millet’s more famous paintings. I like to read from this after the children study a picture and give their narration of it. As noted on our Morning Basket plans: We read from the life of a poet, again from living books, becoming familiar with the poet’s life, his inspiration, the times and culture from which he writes. We choose unabridged works of poetry and read his poetry, choosing a couple of poems to memorize each term. Prose and Poetry for Appreciation edited by Ansorge, Lucas, McCoy, Tower (copyright, 1942) – I found this little gem in our local thrift store for a quarter and took a chance on it, and boy have I been delighted! This is a fantastic book that could stand alone as a poetry appreciation course for any student 8th grade+. There are a few other titles in the series that I’d like to collect. The book is divided into sections or themes (Action and Adventure, Nature, Men and Women, Work and Service, Make Believe) and under each section a poet or author is chosen. A significant portion of an author’s work is excerpted, or sometimes a full piece is given, and following are questions and reflections about the piece. If you know me, you know I’m NOT a fan of reading comprehension type questions, preferring narrations of a work, but the questions following these selections are quite good and can prompt some good discussions with an older student. Some of the follow-up reflections include some very interesting context for the piece presented. The Oxford Book of English Verse and Norton Anthology of Poetry are two good collections of poetry to have on your shelf, and for younger children I still use my old friend, Favorite Poems Old and New edited by Helen Ferris. 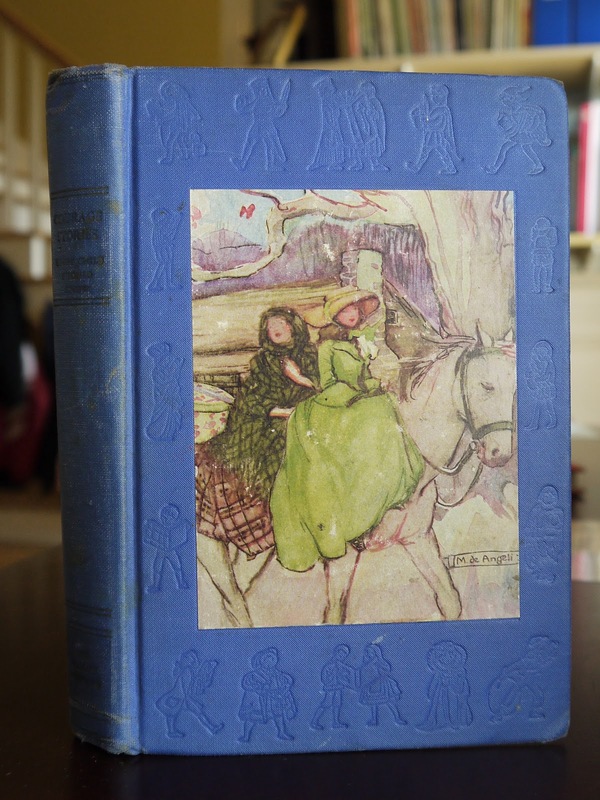 I have found another useful general poetry book that I really like: The Family Book of Best Loved Poems, edited by David George, copyright 1952. I reviewed Walt Whitman: Words for America for you here. Whitman: Poetry and Prose (Library of America edition) – this is a good and complete collection of Whitman’s poetry. Liturgical Reading is chosen to coordinate with the liturgical year, and usually one of the lives of the saints. Because the country is now remembering the Civil War as part of the Sesquicentennial, I find that this is a good place to incorporate some excellent living books on the Civil War. 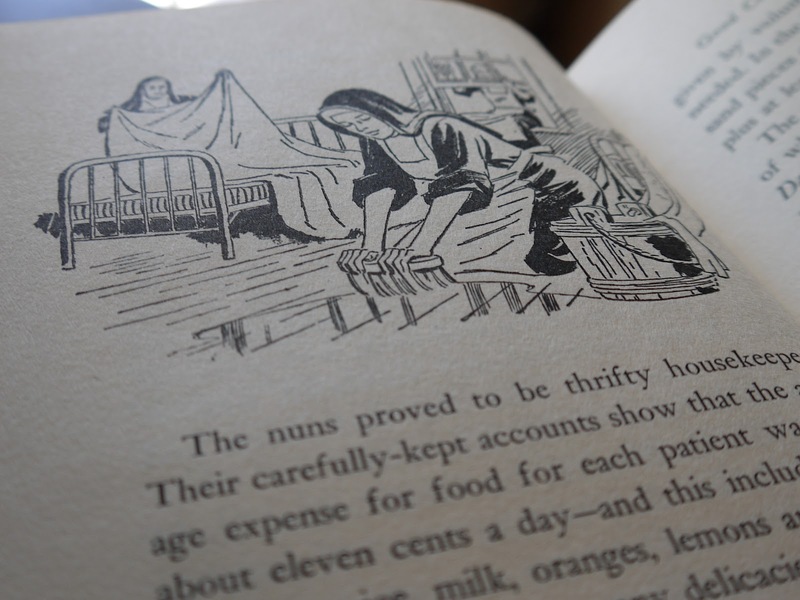 Right now, we’re reading Hands of Mercy: The Story of Sister-Nurses in the Civil War by Norah Smaridge, copyright 1960. 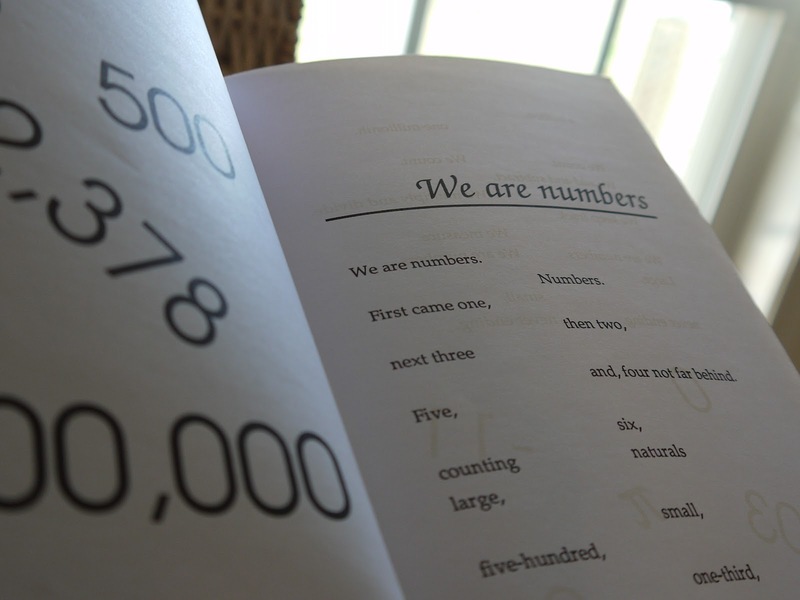 Math Talk: Mathematical Ideas in Poems for Two Voices by Theoni Pappas – This is a fun little book that is really intended to be read aloud and recited by two people! Hence the name! If you have an older student (or two) for whom math is not a relished subject, you need to introduce this little book! It’s a lot of fun for us! Each child reads one of Shakespeare’s plays on their own, as independent reading, but this term we’re starting Marchette Chute’s novel, Shakespeare of London, together. I really do want to incorporate more Shakespeare readings as part of our Tea time reading (where we each take a part and read aloud). 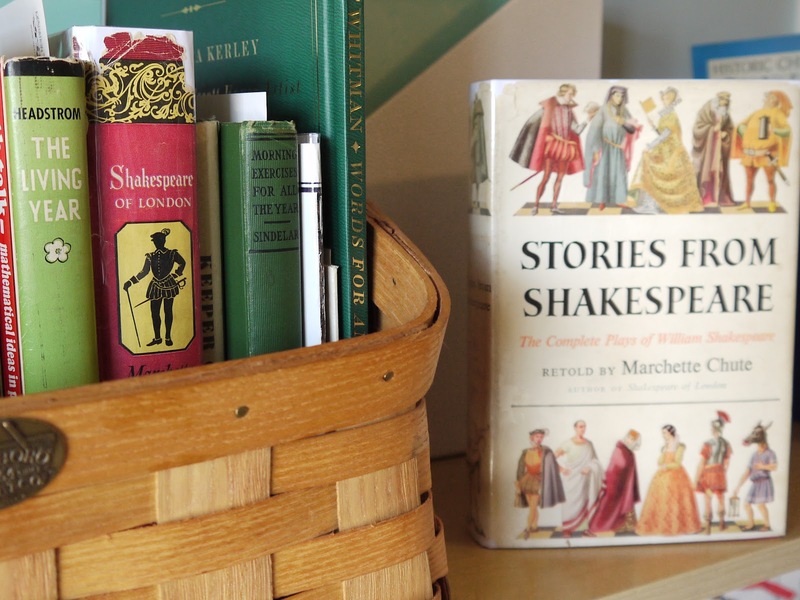 We may start off reading aloud from Marchette Chute’s Stories From Shakespeare just to refresh ourselves on a play. And as an aside, doesn’t Shakespeare’s Flowers by Jessica Kerr look interesting? I found a used copy to highlight some of our Botanical studies and cross-connect to Shakespeare! Gotta love it when books are that efficient! 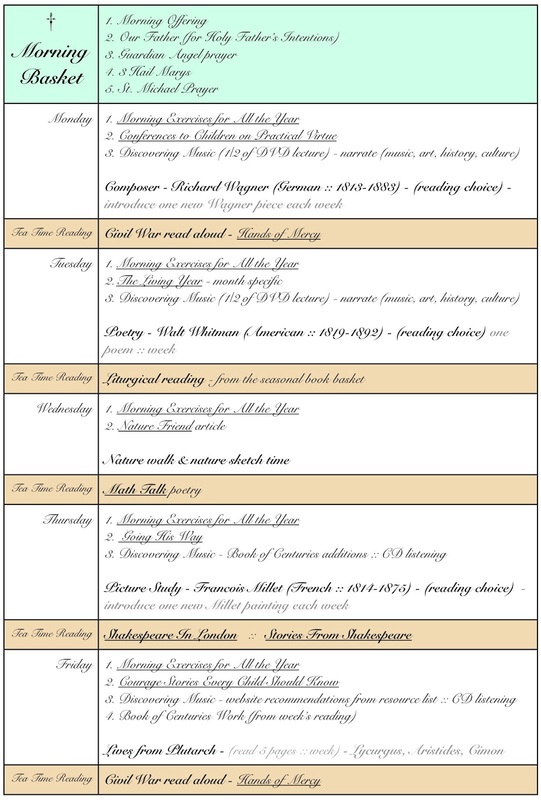 This term (our 3rd and last of the year….who can believe it? ), I wanted to carve out a little area for visual displays for our Morning Basket studies. I wanted to hang a portrait of the three artists we are studying for the term, and I also wanted a place to display the picture (art print) we’re studying for the week. It was an easy little vignette to set up, and I quite like the uncluttered feel of it. It communicates exactly what I wanted it to in very simple terms! I change the focus of the Morning Basket each term as we investigate a different composer, artist and poet. 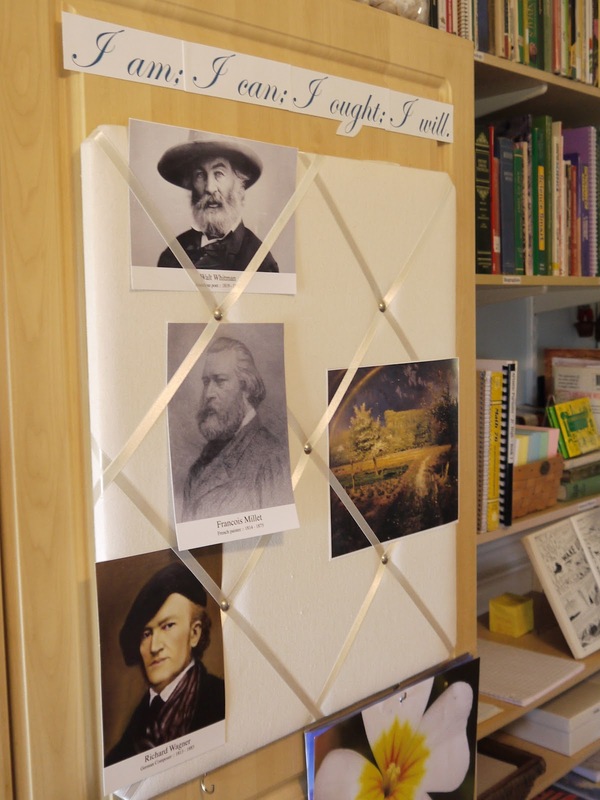 This term we’re studying Walt Whitman as our poet, Jean-Francois Millet as our artist, and Richard Wagner as our composer. I printed a simple picture of each of the men, adding their names and date of birth/death so the children could see the men as they become familiar with them (I added the text to the photos in iphoto in case you’re wondering – I don’t have a fancy editing program). To the right of Millet, you’ll see his piece of art we’re studying as part of picture study for the week. Each week, there is a new art print and this week we’re studying Spring. How appropriate! After completing our Morning Basket work, the children are ready to move on to the rest of the rich feast of books that awaits them in their day! We usually spend from 30 minutes to an hour working and reading from the Morning Basket each day. Well, I think I can safely say that it takes us less time to complete our Morning Basket work than it probably took you to read this long post ABOUT the Morning Basket! 🙂 I hope revisiting the Morning Basket was enjoyable and do let me know if you do something like the Morning Basket in your home, and if you have a neat resource to share, please do!! I’m always keeping my eyes open! Such richness and treasures in this post Jen! I've always enjoyed your idea of a Morning Book Basket; what a delight. Elbert Hubbard was the founders of the Roycroft Campus, which is also here in Western New York where we live. It's a fascinating place. They just rebuilt the old power house. If you ever come to this area, you should take a look. I'd love to see it. Roycroft, among other things, served as its own printing and publishing house. They printed Mr. Hubbard's own books. Mr. Hubbard was a fascinating man – even the account of his death is somewhat fascinating (he died when his ship, the Lusitania, was sunk by Germans). He seems to have been a very intelligent, remarkably successful jack-of-all-trades. The preface to the first three books in the *Little Journeys* series give a very interesting picture of Mr. Hubbard and his many talents, not the least of which was writing across a huge spectrum of history in an engaging, informative way. Yes, I knew about his death. Some of his quotes are painted on the public trash cans throughout East Aurora (that's where Roycroft is). You can eat and sleep in the Roycroft Inn, which has been restored to its old glory. They even use the china that was originally designed there. My husband once gave me a vase with the Roycroft pattern. You can still see the old printing rooms. There are new artisans in the buildings now that sell lovely items. So inspiring, I've been wondering how to 'fit in' all the books I want to read to the children. Off to make a firm list and consider a time. I've been a reader of your blog for a while now, but have been lazy about commenting. 🙂 I'm trying to be better about that and I want you to know how much I love to read here! 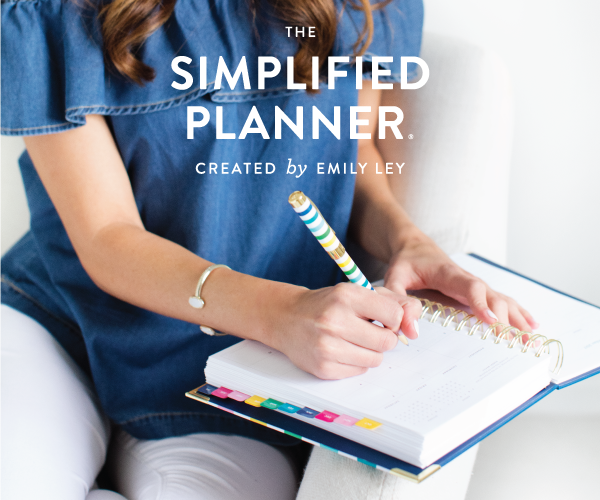 Printing your plan on cardstock is such a great idea, my little post it notes or reagular paper always get lost in the “pile” or all wrinkled up. These books all look wonderful! I will be revamping our morning time! I'm wondering, is it hard to just spend a short time outside and reigning them baack in? My 12 yo would be fine, not so sure about the 6 yo. How kind of you to leave a note for me! You certainly don't need to feel you must comment on this or any blog, but do feel welcome to ask questions! Your question is a good one! >> I'm wondering, is it hard to just spend a short time outside and reigning them baack in? My 12 yo would be fine, not so sure about the 6 yo. < < LOL!!! Well, most all children would prefer spending time out of doors in the sunshine to lesson time! So, yes….sometimes the children would prefer to stay outside. I can't give you a hard and fast rule either….sometimes I let them stay outside!!!! I consider the day, their lessons, the weather, what they're doing outside, etc….and then make a decision. Or, it may be perfectly fine with me if the older children come in for lessons, and the littles stay outside and play. After all, littles should spend PLENTY of time outside in the sunshine! A 6 yo's *sit-down-lessons* should be able to be accomplished in under or around an hour, leaving a generous amount of time for playing out of doors. Going outside with them is one way to help mark the time and prepare them to move indoors to lesson time. In this way, it's easier to set a reasonable pace and set expectations as we enjoy the outdoors by punctuating the time outside with comments like, “Let's look at these bushes down by the trees to see what we find, and after that I think we'll wrap up and head inside to paint the flowers we found.” ….or something like that. If I'm not outside with them, I try to walk outside at some point, engage them, ask what they're doing, what they've found, let them show me and eagerly share their discoveries, and then I might prepare them and let them know that they can spend 5 more minutes before I ring the big school bell. (I have a big brass bell I ring – the sound carries well, and we need that here!) Children are usually better about ending an activity when I've given them a reasonable time to prepare and let them know inside time is coming. Hope this helps you consider this a little more. Let the 12 yo come in and work on lessons! Let the 6 yo stay outside and PLAY and soak up the sunshine! I discovered your blog through a link to your post on a Considered Booklist several months ago, and I have been savoring it in bits ever since! I thoroughly enjoyed this post. Thank you for taking the time to share your days with us. I just wanted to leave a comment in the combox in case anyone is following comments. I edited the original post to add some new material about a poetry series that a friend wrote to let me know about. Your posts are always so inspiring. I am thinking of doing something similar, but in the afternoon, since I only homeschool my one daughter. I thought it would be a nice transition after lunch and make for a peaceful, relaxing afternoon. I'm afraid if we did it first thing in the morning, that if something came up, we might not get in things like math, history, etc. Although they are all definitely touched on here. I went in search of a copy of The Living Year, but it is out of print and there are no used copies on Amazon. I did however, purchase a very cheap copy of The Gift of Music (used in very good condition on Amazon). Thanks so much for the inspiration, Jen! Just wanted to let you know that I just found The Living Year by Richard Headstrom online. I will be content with this until I can acquire a real copy. Thank you! BTW, my in laws live in Miss. and every time we drive through AL, I think of you. This post shows the importance and usage of basket. 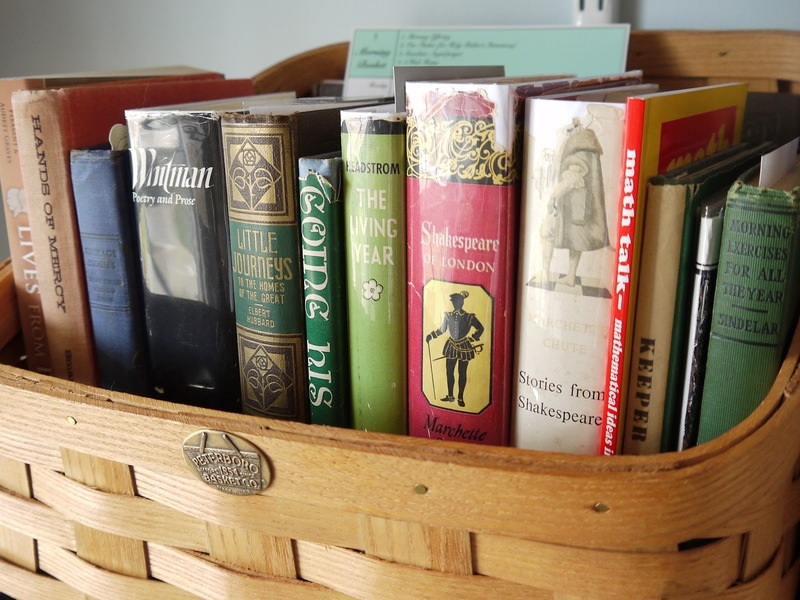 This noy simply as food basket or a flower basket but it can be shelves of your favorite books. How do you fit Mass in? We had to drop our morning basket when the church down the road closed. We only have to travel 10 minutes to get to the other church for daily Mass, but it adds just enough time that the morning is gone before I know it. I just recently learned about the Prose and Poetry series having a Catholic version, and also that Seton had reprinted one of the books for their 12th grade literature course. My friend, Kym, who is a treasure of knowledge when it comes to oop books and book series, wrote to let me know. I added some of that information to the Morning Basket, but I'm so grateful for your take and review of the Seton reprints. Thanks for writing *Union With God*!!! Oh Jen, what a treasure trove of book recommendations! I'm so glad Renee recommended your blog to me. You're a font of great ideas! Thank you for posting all this. Thank you for this post, Jen. You inspire me in homeschooling the CM way. I tried it once a long time ago with my boys (now 10th and 11th) and never could find a rhythm. Do you have any advice for starting over again with my girls (K & 2nd next year)? What to use etc. 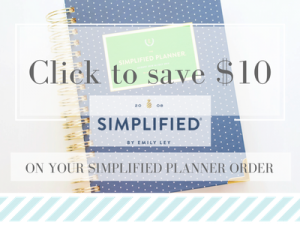 I like the Simply Charlotte Mason website so much but don't want to really deal with non-Catholic resources. It sure does look simple on there though! Any help would be so appreciated as I plan for next year. Thanks and God bless you! Thank you all so much for your warm and kind notes about the post! What a blessing if these shared ideas prompt an idea which is useful and malleable in your own homes!! How wonderful to see you here!!! Email Me and we can brainstorm some specifics together! I really like the SCM resources and website, and frankly, I find them quite respectful in terms of our Catholic faith. I use a number of their recommended resources with little or no tweaking. 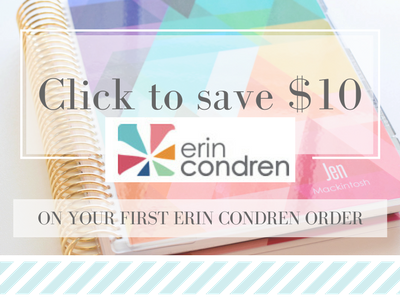 In fact, they're Planning Your Charlotte Mason Education DVD and book is a great place to get started as you consider next year! If you email me I'd be happy to send you my K/1st plans and booklist as well as my 2nd grade booklist. They might give you some ideas. 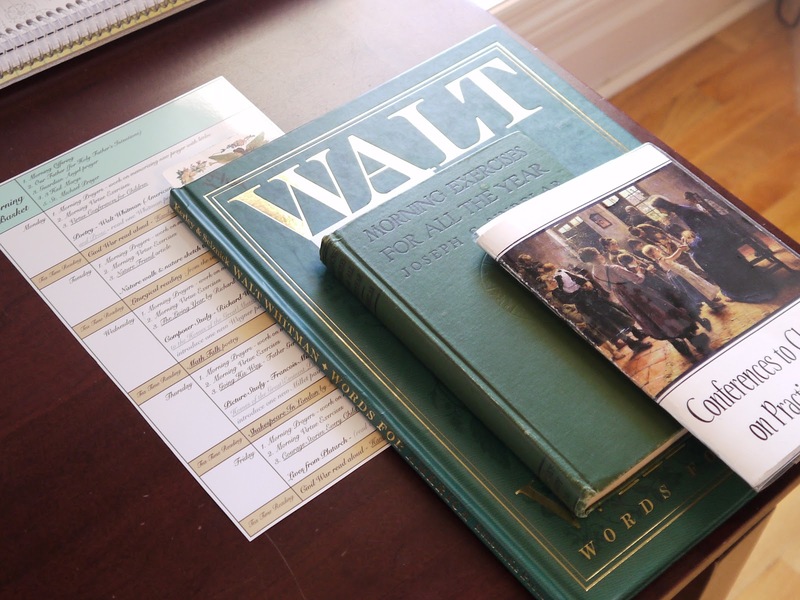 I'd probably take those and then sit down and check out Ambleside's and Mater Amabilis' offerings….going back and forth looking at the book ideas and general layout of each. Keep a good sense of your own family in mind as you do. You might also like my post on A Considered Booklist, too. I'm in full basket mode at the moment here Jen thanks to your inspiration. I'm very interested to read your update and will look forward to discovering some new books to read as I work slowly through your post. A few months ago it finally clicked why baskets could work for us. I made up my 'morning basket' from your list, as I had the better majority of it and felt it would be what I wanted in my morning basket too. I made up a name tag 'morning basket' with water colors. A few weeks went by and I realised it wasn't going to be a morning basket. So I took off the label and made a new one, 'daily basket'. Then a few weeks ago I realised that I was in danger of having a 'seldom' basket, or even worse, a 'never' basket. So I had a think about it. I had the wrong books in the basket, that's what it was. So I thought a little more and came up with what could be, and has been to this point, a daily basket that suits us. I have started up all kinds of baskets now. Maths basket, science basket, Australia basket. In fact I may just have gone basket crazy 😉 but it is good to have found an idea that is helping to make good use of our books. Thanks for the inspiration. I have a stack of these books that every day is too often, but then I forget and don't get to them often enough. I've been lacking “THE PLAN” more than anything else! I'm excited to work out my basket to start the next trimester with. I have two of the St. Thomas More books now, Prose and Poetry for Appreciation, and Prose and Poetry of America. Both are extraordinary, and the recommended reading lists at the end of each discussion following the selections are extraordinary and quite rich! What fantastic books!! I love seeing the books you have found to use in your homeschool – so many of them look just wonderful! And I love to see how others organize their days… I am lacking in that right now, as I have a 6 month old, but I tell myself one day, I'll be able to do more, once she is more independent! We do a morning gathering I call Circle Time since I just have kids age 7 and under… but we read about whichever saint might fall that day on the calendar, we sing a hymn related to the month/season (we're doing O Sacred Head Surrounded for Lent), and we read poetry from A Child's Garden of Verses and The Child on His Knees. And I read/recite a few Mother Goose rhymes with my four yr old. I can see its similarities to a morning basket, so I am loving seeing an example of a possible way for it to evolve! And wow, an hour one way to get to Mass! You must be going to Chattanooga or something!! What a fantastic idea! I definitely need to implement something like this in my house, too often I get wrapped up doing my own thing in the morning and we don't spend any quality time together as a family until we start school at 10 or 11am. This is truly a treasure trove! Bookmarking this one! If you have time could you send me an email or direct me to where I should look? I wonder even if there is a enjyable series of books that a young girl could be inspired by? By the way, I have incorporated “baskets” in my schooling and it's wonderful. We have our morning basket, which is mostly bible/catechism and sits in the dining room. I use this during our meals. I have a preschool/kindergarten morning work basket then a evening reading basket for the kindergartner. Since, I do not stay in on place to homeschool this has saved me steps and helped me “think outside the box”. I have been gleaning off of you!! Hi Josette and thank you for your kind note! I'm so glad you're finding ways to make baskets work for you in your home – what a joy it is when we see ideas, adapt them, think about them, and make them our own and find things fitting better and working better in our spaces! You asked about a book or series for a young girl and I have just the thing! Check out my post – Literature for the Young Lady at the Bend in the Road. It is suited for a young lady around the age of 12 years of age and is based on the Anne of Green Gables series. It's actually a year's worth of reading, but you'll find many, many book ideas there. I have such dear memories of completing that year with my oldest daughter! Hope you enjoy!